The atlas moth is large, unique, and mostly found in southeast Asia. Most people think of moths as the nuisance drag pests that fly around the light at night. There are approximately 160,000 species of moths inhabiting several continents around the world. The atlas moth is one of the largest species of moth. It is found in southwestern parts of Asia, and are the preferred moth for those who keep moths as pets. 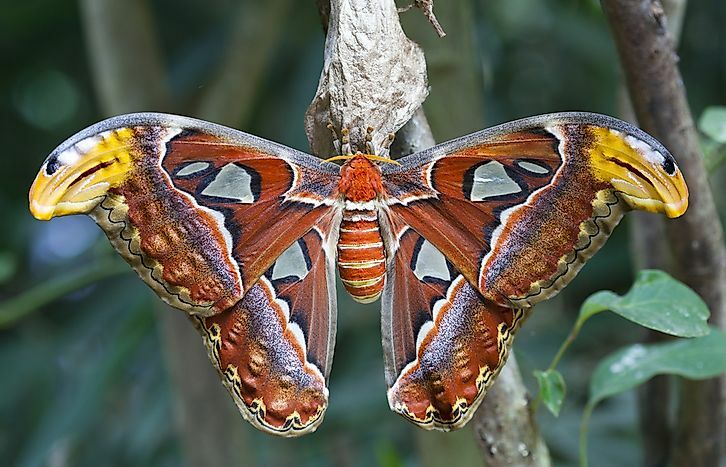 The Atlas moth is large with a wingspan of about 10 inches and surface area of 62 square inches; it is among the largest moths only rivaled by the Hercules moth. The females are slightly larger than the males. The lower and upper wings are reddish-brown with pink, black, and purple outlines. The moth has four lifecycles; egg, larva, pupa, and adulthood. In their caterpillar stage, they are greenish white in color with bright red spots on their feet. They pupate when they grow to 4.5 inches, and have a pair of antennae that is light and fairy-like. The tip of the wings can fold to look like a cobra's head. The Atlas moth does not have a mouth; it, therefore, does not eat. During the caterpillar stage, they eat a large amount of food which they store as fat. They feed on citrus, willow, and foliage. As pupa in a paper sack, they feed on the foliage of citrus and cinnamon leaves. The atlas moth inhabits Southeast Asia particularly the environment around the Malay Archipelago. They stick close to their hatching place because they do not have the energy to roam far. They are kept as pets by a lot of people because they do not try to escape, and they require very little attention. The adulthood of the Atlas moth revolves around sexual attraction. They have a short lifespan, and their main aim is to reproduce. The female moth releases a strong pheromone that attracts the male. They mate close to the nesting place because they are not good fliers and the female cannot fly far from her chrysalis. After mating, the female burrows a hole on the foliage and lays about 300 eggs. It takes fourteen days from the eggs to hatch. At the larva stage, the egg matures to a caterpillar which looks like a ferocious predator, but they are harmless. They are nocturnal insects and spend their day resting and only start looking for a mate at night. The Atlas moths are beautiful and make wonderful pets, and they produce silk just like the domesticated silkworm. The moth is cultivated for their silk in India, and their cocoons are converted into purses in Taiwan. Unlike the silk produced by the silkworm, the Atlas moths secrete silk in the form of broken strands. Researchers also keep them for research purposes particularly those concerned with the production of silk. They do not have a mouth and therefore do not eat. They live in Southeast Asia, especially around the Malay Archipelago. The atlas moth is one of the world's largest moths. It is not unusual for the atlas moth to be kept as a pet. Their wingspan can measure around 10 inches. This page was last updated on July 19, 2017. What Type Of Climate Prevails Over The Southeast Asian Region?